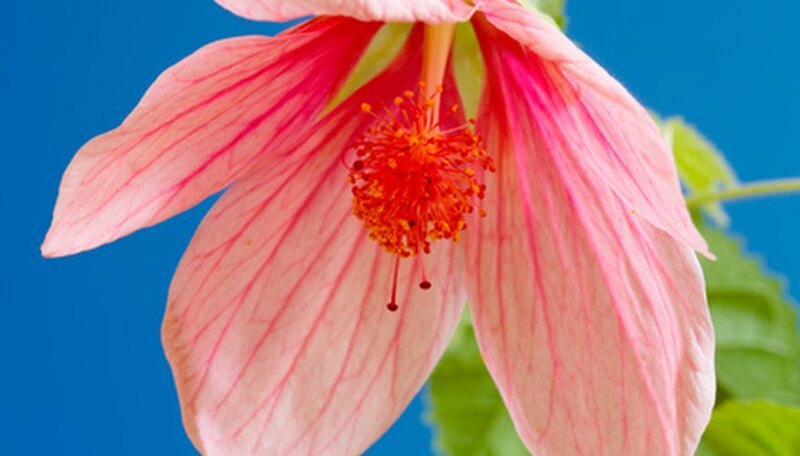 The 150 species of abutilon includes annuals, perennials and shrubs that grow in subtropical and tropical regions as well as species that make suitable houseplants. Well-known species include the flowering maple, named for the shape of its leaves, and the Chinese lantern that yields colorful, dangling blossoms. Most hybrids on the market are easy to propagate and grow. Abutilons well thrive in a general-purpose potting soil that drains well. Sand, peat moss or perlite will correct packed soil. A good mix is 1 part perlite or coarse sand, 1 part garden soil and 1 part humus or moist peat plus a light dusting of lime. Clay pots work well, and all pots should have a drainage holes. Abutilons are suited for porch containers; in the garden they can grow up to 10 feet high. Abutilons like water, but they should be well drained. If hot sunny weather persists in the fall, water abutilons several times a week. They need less water in cold, rainy weather. Abutilons do well in bright, indirect sunlight and temperatures from 60 to 85 degrees F. Light coming from the south or west is best. Move them inside on frosty nights. If given minimum care, abutilons yield open-faced blossoms throughout the year. Give abutilons a 20-20-20 or other balanced, slow-release fertilizer once every three to four weeks during the growing season. If abutilons become root bound, their leaves turn yellow and drop. Do not fertilize after September. Abutilons may be pruned when they are actively growing to prevent them from becoming leggy. To stimulate new growth and blossoms in the spring, prune them back by 30 percent in the winter. A light, year-round pruning helps stimulate new growth and fill out hanging baskets. Sow seeds for abutilons destined to be grown outdoors from February to April. Soak them overnight and place them in soaked plugs of peat or spaced 2 to 3 inches apart in trays containing moist compost. Cover the plugs or trays with a thin layer of compost or vermiculite and kept in a warm place. Keep the compost moist but not waterlogged; the seeds should germinate in three to 31 days. Move seedlings into 3-inch pots and put outside for increasing periods over two weeks so they adjust to the weather. Plant outside after the danger of frost has passed. If they're grown indoors, plant abutilon seeds any time of year. Yellow sticky traps are useful to control spider mites that like abutilons. A brisk spray of chilly water will control red spider mites, another abutilon pest. Use insecticidal soaps to control aphids and scale.